Last night I went out to dinner with a friend, and she told me she was waiting for my next blog post, and I had better get on it. So, Christine… this one's for you. Whenever I've been absent from my blog for a while, I figure the least I should do is show back up with a "before and after." 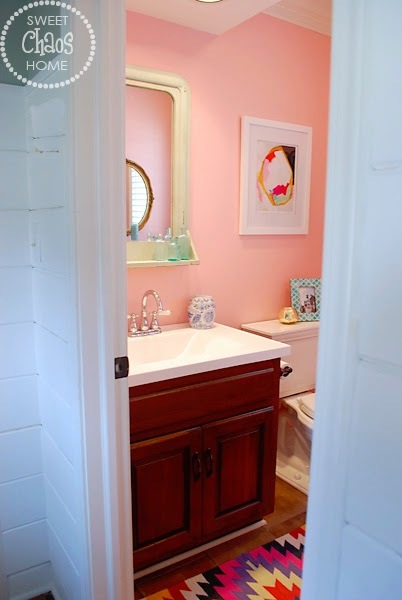 Therefore, may I present our newly refreshed powder room? 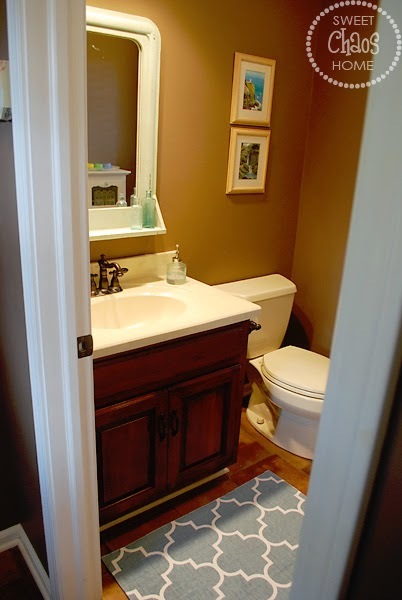 And before I knew it, I was replacing the beige toilet and countertop, painting the walls, and adding new accessories. 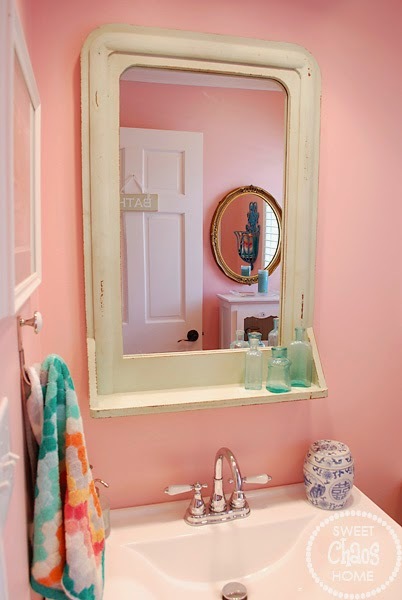 Pink walls… I know, I know… I tried to pick a different color, but what other color goes as well with a minty green mirror? It had to be done. This powder room is right off our side entry (aka Grand Central Station), so lot of kids are using the facility. I wanted it to be colorful and whimsical. I tried to use accessories that I already had, like the wall planter that I spray painted turquoise and filled with extra hand towels. And, I moved this mirror in from another room. 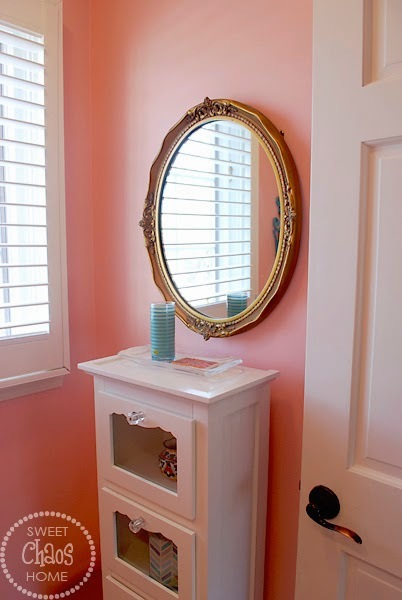 Because, duh, you can't have too many mirrors in a room, even a tiny powder room. I'm pretty sure I read that somewhere. The glass bottles, ginger jar and art I already had on hand. 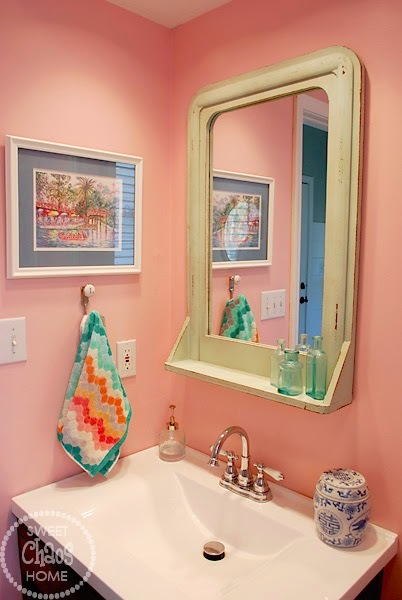 The towel hook is from World Market, and the towel is from Target. I absolutely love my new art print from Britt Bass Turner. 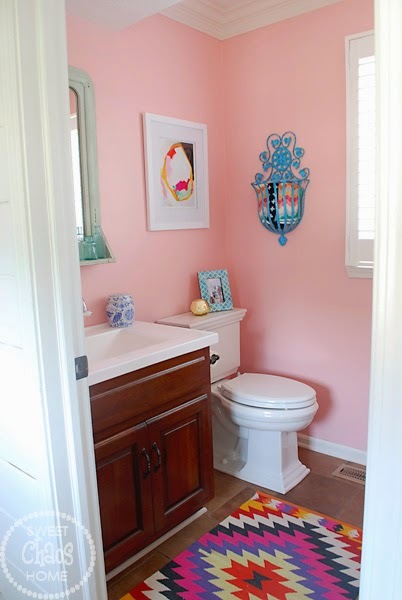 I'm sure she always dreamed of having her art grace the walls above someone's toilet. And, as much as I dreamed of finding a vintage kilim rug for this space, finding a 2' x 3' in pretty colors in a decent price range is practically impossible. Luckily, Urban Outfitters makes this perfect knock-off. 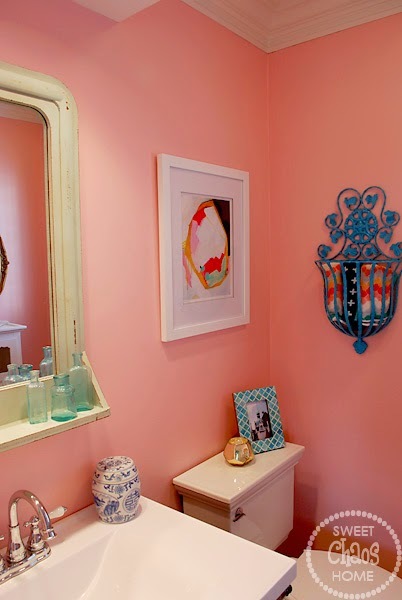 I'm really digging the eclectic, boho vibe of my little powder room. Small spaces like this are the perfect place to experiment with a different look. 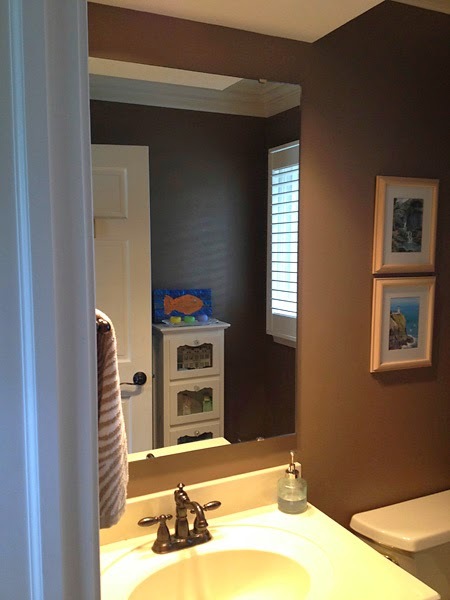 If you've got a basic, brown, boring box of a room, why not step out of your comfort zone and shake things up a bit?